Search for the best flight prices from Manchester to Orlando. Compare prices, book today and save money with Manchester Airport. 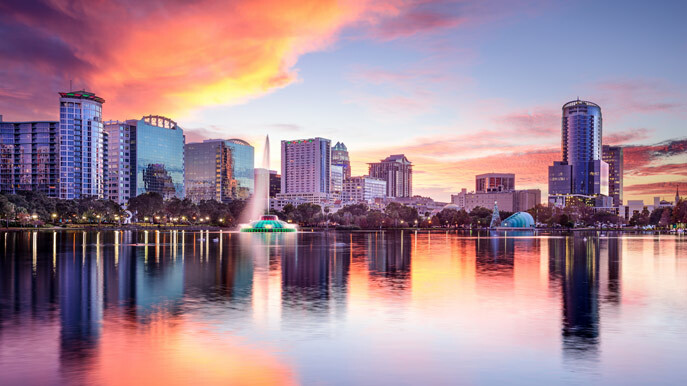 There’s so much to do in and around Orlando that two weeks often isn’t enough to squeeze it all in. Millions come here every year, not only for nearby Disney World and Universal Studios (not to mention the Space Coast just an hour away) but town-sized shopping malls, global cuisine and clear, sunny skies. Orlando’s standing as the theme park capital of the world means that there is an abundance of hotels from high profile chains, such as the Ritz Carlton Orlando Grande Lakes (4012 Central Florida Parkway), a five-star offering complete with 18-hole golf course and vast spa area. The theme parks themselves often provide mid-range accommodation on-site, including the Coco Key Orlando Water Resort (7400 International Drive), which boasts its own amazing water park. Close to Universal Resort is the affordable Econo Lodge International Drive at Universal (7102 International Drive), which, while quite plain, fits well into the tighter budget. Souvenir shops and generic national chains dominate central Orlando and its tourism hub International Drive. If you want to pick up a plush Mickey Mouse or a cut-price bikini then this is the place to look, but venture off the tourist trail and you’ll be rewarded by some more interesting finds. The Mall At Millenia (4200 Conroy Road) is the city’s most upmarket mall, and houses brands such as Bloomingdale’s, J Crew and Anthropologie within a serene glass bubble. A colourful collection of fresh and home-grown produce makes the Sunday Orlando Farmer’s Market at Lake Eola a worthwhile weekend excursion. And offbeat bookshops such as the spiritual Spiral Circle (750 North Thornton Avenue) are perfect when you want to while away a few comfortable hours in the cool. For those who want something high-end, try Chef’s Table at the Edgewater (99 West Plant Street, Winter Garden), or Seasons 52 (7700 Sand Lake Road), a sophisticated fresh grill and wine bar. If you’re travelling with kids however – which, let’s face it, is more likely – then go to Disney’s 1900 Park Fare (4401 Floridian Way), where kids can dine surrounded by their favourite cartoon characters. Alternatively, try the rotating Garden Grill restaurant (The Land Pavilion, Epcot), where Chip 'n' Dale play host. Based at the Mennello Museum of American Art, this popular festival livens up the winter months in Orlando with plenty of music, dancing and fun. The main stage is dedicated to folk and Americana music, but fringe events include traditional craft demonstrations, storytelling and an art fair. With carnival rides and games, as well as a flea market, food fair, livestock display and over 100 live bands, this long-running fair is a highlight of the Orlando calendar. This 13-day celebration is the biggest of its kind in the USA. Its wide remit includes art, theatre, music and comedy, with hundreds of uncensored acts taking place in various venues across downtown Orlando. Set against the rural backdrop of Lakeridge Winery, this is a traditional harvest festival that encourages visitors to involve themselves in the annual ‘stomping of the grapes’. Expect displays by local artists, live music and plenty of food and drink. One of Florida’s largest Hispanic festivals, Calle Orange is a lively gathering of different cultures, races and creeds that takes over downtown Orlando for a day and a night. The riotous celebrations encompass dancing, music, food and colourful costumes. If you're planning on hopping from theme park to theme park, why not rent a car at the airport to make the trip between adventures a little easier. To make sure you're in the driving seat every step of the way, we work with the best car rental services to give you the best price on your rental car. Book now.